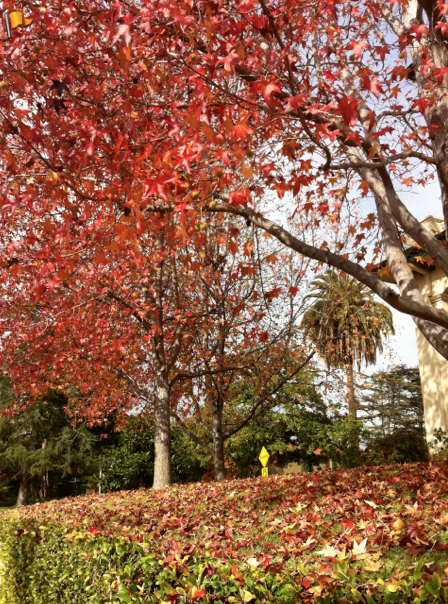 You can find Autumn in Los Angeles. You just have to look for it. Amid the green trees and freshly layered sod, you can turn a corner and find an entire street lined with deciduous trees, turning brown and yellow, shedding leaves until winter hits and the entire avenue looks like something out of your east coast/mid-west suburban winter memory. Then you can turn another corner to find palm trees and ficus trees growing like it’s summer time where barbeques are smoking and canon balls are splashing down in a pool. Fall is my favorite time of year. The chill in the air, the early nights of deep, long shadows that create a lovely feeling in the brain. Nesting, holidays, baking – suddenly we’re seeing jack-o-lanterns and fake web on bushes, and Halloween candy in stores, and the excitement of the onset on Pumpkin Spice season – as touted in the latest Trader Joe’s “Fearless Flyer”. I left the east coast for the west four years ago because of those horrible NY winters, and yes – my home state got socked with exceptionally bad storm fronts since I left town. But as one LA sunny day folds into another, as one week turns to month after month of no substantial rain, I find the constant state of nothingness in the climate almost deadening. The sun is blinding. The air dry. The sky always blue – providing a surreal world of perfection to the point where another gorgeous sunny day is mockery. It’s becoming scary. The ground and trees on the hiking trails at Griffith Park are bone-dry parched. The smell of dry cedar and dust particles clog your nose and get down your throat. The heat index can rise up into the hundreds, burning the dry soil, baking what were once moist, water filled streams that used to bubble up from the mountains. The sweet, dry smell of heated wood makes you feel that one strike of a match could cause the whole forest to ignite. Weather. How I miss you. I need the turmoil of a late day summer thunder drench. The soul needs to be fed with the mixture of season, the drudgery, and the welcoming beauty of all that waiting and freezing and dry sky – to find that warm spring ozone air breaking through on a March afternoon. The happiness caused when noticing a crocus poking out of the dark, barren earth. Turning around and seeing a forsythia bush flourishing yellow blooms within the dead brown branches and bark of winter – which is slowly, slowly turning into spring as the promise of green leaves, warm weather, shedding socks and boots for barefeet and flip flops becomes real. Then it’s wonderful, wondrous summer! The season you’ve earned after shoveling snow and suffering frostbite from waiting at the train station. Summer – when Sly and the Family Stone’s “Hot Fun in the Summertime” makes you weep for joy at the memory of summers past you can relieve in the splash of the pool and the incredible coconut smell of Coppertone. You don’t get that in LA. It’s always nice – always pleasant. It gets chilly, and you can imagine for just a moment, being back home under the red leaves of an autumn maple tree. You can feel safe in the warm pocket of southern California sunshine when you hear the rest of the nation is buried under ten feet of snow. But one season folds into another – and you wonder if going back into the thick of winter blues may be worth it. 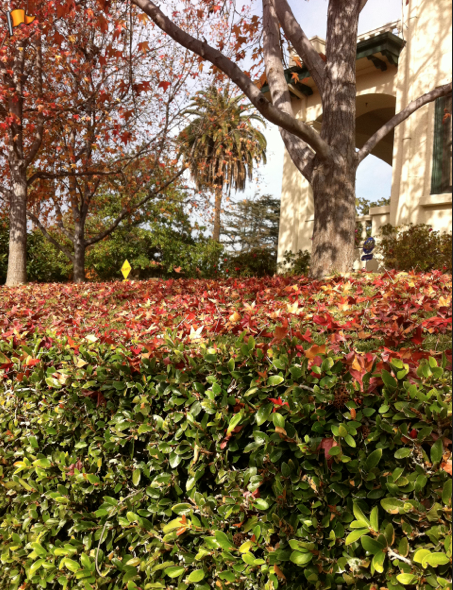 Categories: Friday's End of Week Musing | Tags: Autumn, Drought, Fall, Los Angeles, New York | Permalink. Thanks for this look at Autumn in LA. I always thought that this time of year the birds turned color and fell out of the trees! There is something to be said about the East-Coast-burning-leaves experience leaving a lasting memory in our souls. So true, Allan. The smokey aroma that lingers in the air, among the foil foilage makes me miss NY so much. I do love California, tho. Perhaps there’s more fall spirit up in SF? There is some, now that the weather is cooling off. The leaves on the Liquid Amber trees in our neighborhood are starting to turn colors and our Japanese maple is not far away from going orange.